• Refer a friend and get 50% off your next cleaning! At Bit a Bliss Cleaning we think it is important to give back to the communities that we work in. If you know someone that deserves a free cleaning, we want to know. It can be for any reason you think is deserving. We will choose one nominee a month and give them a Bit a Bliss! Bit a Bliss Cleaning also participates in Cleaning For a Reason. Fighting cancer is difficult enough, but living with it is even tougher – and that’s where the Cleaning for A Reason Foundation steps in. 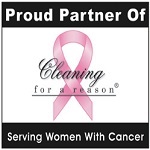 This nonprofit offers free professional housecleaning and maid services to improve the lives of women undergoing treatment for cancer – any type of cancer. Go to http://www.cleaningforareason.org for more information. If you know someone special that deserves a free cleaning from Bit a Bliss, go to the Contact Us page and tell us why!